The Southern Indian Ocean Expedition to Heard Island in 1964 was a remarkable achievement which, until fifty years later has been little appreciated other than on the expedition members home turf of Australia and New Zealand. Under the overall leadership of Warwick Deacock, the expedition also included Bill Tilman as skipper and high latitude navigator and sailing master. “More than half a century on, it is easy to forget that no-one had done it before. There had been expeditions to Antarctica and the sub-Antarctic islands, but these had all comprised substantial bodies of men on ships of a sensible size ﬁtted out for ice and the Southern Ocean. They may have had sails, but they were mostly powered by steam or diesel engines. Even when sail was the only option, back in James Cook’s day, his Resolution was 111 feet long and carried a complement of 112 men. To most people in 1964, therefore, it seemed a preposterous proposal that ten men should undertake a sailing voyage of 10,000 miles across the Southern Ocean in a sixty-three-foot schooner to land on a harbourless, ice-covered island and make the ﬁrst ascent of a 9000-ft volcano. Men ships had sailed to remote places before, alone or with small crews, but none with so much ambition. “Heard Island in Lat. 53° 10´ S. Long. 73° 35´ E., is an uninhabited sub-antarctic island lying about 300 miles to the south-east of the much larger island of Kerguelen. Measuring only some twenty-three miles by twelve miles it culminates in the peak known as Big Ben which is 9005 feet high. Thus the island is nearly all mountain, a mountain heavily glaciated on all sides; many of the glaciers terminate in ice cliffs that are washed by the sea. As far back as 1957 I had had an eye to Big Ben but enquiries had shown that there was no safe anchorage where Mischief could be left. A letter, too, from Mr P. G. Law, then (and now) Director of the Australian Antarctic Division, had been discouraging. ‘As regards your getting to Heard Island,’ he had written, ‘I cannot overstress the dangers which will face you if you proceed in a small boat. As you know, Heard Island is right in the track of the great westerly cyclones which sweep across the Southern Ocean with almost no intervening period of good weather of any duration. The seas are mountainous and altogether I can think of no worse place to sail small craft.’ More than that, the lack of a safe anchorage meant that the boat, after dropping the shore party, would have to be sailed to Kerguelen where there are many good anchorages. With Mischief, with a crew of only six, I did not think this was on. It was the usual difficulty of being in two place at once. I myself would certainly want to land on Heard Island, and equally certainly I would not like to leave a reduced crew with the responsibility of navigating to Kerguelen and back again. I should have felt extreme anxiety both on their account and on my own, for if for some reason they had failed to return, the shore party would have been residents of Heard Island for a long time. From 1949 to 1954, when it was abandoned, Australia had maintained there a scientific base—huts, electric light, and hot baths—so perhaps we should not have been badly off. But in the end I decided to leave Big Ben for better men and went instead to Îles Crozet and Kerguelen. At least we went there at the second attempt, the first having ended when we suffered some storm damage, after which we had to be content with circumnavigating Africa. In the winter of 1963-64 I heard from Warwick Deacock, an ex-Army officer and a climber, then living in Australia, who was organizing a private expedition to sail to Heard Island with the object, among others, of climbing Big Ben. Patanela, a 63-foot steel schooner, had been chartered for five months and he asked me to act as navigator, knowing that I had once been interested in Heard Island and had visited Kerguelen. A large amount of money had still to be found including £A8,ooo for the charter. For several years Patanela had been employed in cray-fishing in Bass Strait and the charter figure was based—oversanguinely, one thought—on the amount that could be made in a season’s fishing. At that time the two owners and active managers of the boat, the Hunt brothers, were to have come with us. In the end they had to drop out and I was then asked to skipper Patanela as well as navigate. These two complementary accounts, the former lavishly illustrated in the fiftieth anniversary edition with the black and white Rolleiflex images taken by Warwick Deacock, provide a fascinating account of a truly remarkable expedition. 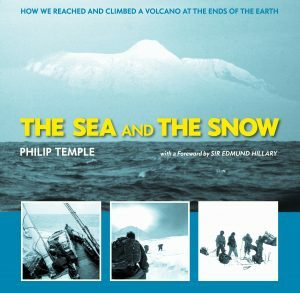 Philip Temple’s book also remains one of the few independent contemporary accounts of a Tilman voyage. 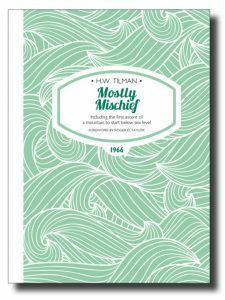 The reader of both accounts will get a fascinating insight into what lies ‘between the lines’ of Tilman’s own writing. Also finally available in the public domain is a fourteen minute edit from seven hours of film from the expedition. The silent film footage, recently edited and captioned by expedition scientist Dr. Grahame Budd, provides a fine visual summary of the expedition.